This is a copy of Greywulf’s post to the M20 wiki, AKA the lazy-gamer's guide to world building. Microlite is all about simplifying gaming to the point where the rules don’t get in the way of the role-playing, while at the same time retaining usability from d20 adventures, supplements, etc. From a campaign point of view, the simplest way to do this is to evolve the world as the game progresses. Plan ahead, but only as far as the next few steps—then stop. One way to do this is to use a simple blank hex grid. Set the scale small—say, one hex = 3 miles—and put one adventure inside the centre hex. Populate it according to the needs of that adventure, then move on. Work around that one hex adding other adventures, all around roughly the same power level. Think about the kind of adventures you (as GM) enjoy playing, and the feel you want to impart. By the end of this, you’ve got seven adventure settings and a solid core for the game world. It’s likely you’ll want to change something because of events in the first adventure, but that’s fine. 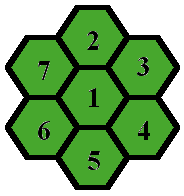 Perhaps the gamers enjoyed a section set in a forest, so you want to change one of the adjacent hexes to expand that locale. That’s cool, as it means that the players are involved in the gameworld itself. It’s likely you will see links between adventures. Perhaps the Evil Bad Guy in one adventure is similar enough to one in another that the same villain could make a reprise. Interweave plot threads to make the players feel like they are a part of a larger story, and leave some hexes blank for future use. Some places—particularly cities and towns—will be reusable. Expand them as needed. Finally, add in roads, rivers and other details. As you progress, new ideas and a backstory will develop of it’s own accord. The goblin raiders in one adventure will become scouts from a distant Goblin Empire; an NPC might come from a nearby city state, and the Wight’s Barrow will be a lost reminder of a long forgotten battle. When the time is right, add more hexes and adventures. Re-visit and re-work previous locales. Perhaps that first dungeon the adventurers cleared out is now home to something more sinister, or the Elves in the Twisting Forest in hex 3 send out a call for help. Let the campaign setting evolve with the players to create a setting that feels alive. Within the Circle (Dungeon 130) – Thistle village, depot. The Walking Dead – An adventure of my own making. Zombie hordes wipe out a town and march toward Saltmarsh. Khorvalen town, forest. The finished layout looks something like this, perfect for a starting campaign and rife for further adventure. Extra elements can be added and changed as required, but there’s enough groundwork in place to begin with. As the adventures develop, there’s room to fill in the political blanks; factions and enemies will rise from the adventures themselves rather than premeditation. With such a clean slate, it’s possible to turn the game in any direction with minimal effort. It’s a simple matter to change the grid scale to suit the genre. For a world-hopping sci-fi game, each hex could represent a star system in the best Traveller style. For gritty urban fantasy or a modern game, each hex could be a single district in just one city. 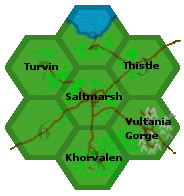 Even less: Just Three Hexes - Campaign Starters by Michael “Chgowiz” Shorten.